We’re excited to share that we have a brand new Facebook fan page! 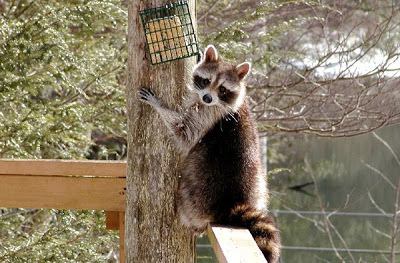 On our Facebook page, you can see our seasonal photo albums and photos we take around the Inn, such as this one of a little visitor we saw just yesterday at the suet feeder outside of the Inn’s solarium. We’ll also be creating photo albums for photos taken by our talented guests as well as area attractions that our guests enjoy, such as Chimney Rock, Grandfather Mountain and Biltmore Estate. Additionally, we’ll be sharing local events and information about the fantastic shops and restaurants in Asheville, Black Mountain, Old Fort and other great towns nearby. Our blog posts and Twitter posts will also be linked up to Facebook, so you can get everything all in one place if you like. We hope you’ll join us on Facebook by becoming a fan of the Inn on Mill Creek. We look forward to connecting with all our fans! This entry was posted in Uncategorized and tagged Facebook by Inn on Mill Creek. Bookmark the permalink.